Ryan Briscoe (born 24 September 1981) is an Australian-American professional racing driver from Sydney who has raced open wheel and sports cars in Europe and America. In IndyCar he collected 8 wins and 28 podiums, finishing third in the 2009 season, fifth in 2008 and 2010, and sixth in 2011 and 2012. In sports car racing, he was runner-up at the 2007 American Le Mans Series LMP2 class, and won the 2013 12 Hours of Sebring LMP2 class, the 2008 and 2013 Petit Le Mans LMP2 class, the 2015 24 Hours of Daytona GTLM class, and finished third overall at the 2008 24 Hours of Daytona. He has been married to ESPN anchor Nicole Briscoe (née Manske), since 2009. In April 2018, he became a naturalized American citizen. In addition to his native English, Briscoe speaks Italian and French. He attended Trinity Grammar School in Summer Hill, Sydney, Australia. Like many racing drivers, he started his career in karting, first racing in 1993. After winning Australian, North American and Italian championships, he moved to Formula Renault in 2000. He won the Italian Championship in 2001 (winning 5 races) and finished 4th running a limited schedule in the Eurocup (with 2 wins in 6 races). In 2002, he became test driver for the Toyota Formula One constructor. He started that year racing in the Formula 3000 series, but struggled and left his ride after 7 races. He finished the year in the German Formula 3 series, taking 3 podiums in the last 6 rounds. He won the Formula Three Euroseries in 2003 (winning 8 races in the process). He became the Toyota F1 team's 'third' driver (i.e., drove the team's test car on Fridays at Grands Prix) for the last third of the 2004 season, after previous third driver Ricardo Zonta was called up to replace Cristiano da Matta. There were rumors that Briscoe was set to race for the Jordan Grand Prix F1 team in 2005, due to the team's acquisition of Toyota power. Instead, Briscoe raced for Target Chip Ganassi Racing in the Indy Racing League, including a 10th-place finish in the Indianapolis 500. He also made his Rolex Grand-Am début with Ganassi at the 24 Hours of Daytona. He took pole position at Sears Point, but struggled on the ovals and was involved in several crashes. On 11 September 2005 he was involved in a violent crash at Chicagoland Speedway, breaking both clavicles among other injuries. His car climbed on top of the Red Bull entry driven by Alex Barron and went airborne into the catch fencing above the retaining wall and snapping in two. He was released from the hospital on 19 September and following some initial treatment in the USA, moved to the specialist Formula Medicine facility in Viareggio, Italy, for the bulk of his rehabilitation. It took 8 weeks for Briscoe to recover from the injuries he sustained in the crash. His official web site announced his return to the USA on 14 November 2005. Briscoe was dropped by Ganassi for 2006, replaced by 2005 IRL champion Dan Wheldon. During the winter, he tested with fellow Australian and Champ Car owner Kevin Kalkhoven's PKV Racing team. Briscoe also tested for the Mi Jack Conquest team. Briscoe competed in the 2006 24 Hours of Daytona with 2005 Champions Wayne Taylor, Max Angelelli and Emmanuel Collard, but the team withdrew due to accident damage before Briscoe's turn to drive. In 2006, Briscoe was announced as an endurance driver for Holden Racing Team, set to partner Jim Richards at the Sandown 500 and Bathurst 1000. He also drove in the A1 Grand Prix race at Laguna Seca in the USA for A1 Team Australia, scoring three points. At the Indy 500 he was a surprise late driver of the #48 car for A. J. Foyt Racing – the deal was so late he was still having his seat fitting with less than half an hour of Bump Day qualifying left, and he never got out on the track to attempt a qualifying run. He returned to the IRL the following week and drove the #5 Dreyer & Reinbold Racing Dallara to a third-place finish at Watkins Glen International, a road course. He returned to the Dreyer & Reinbold team on a three race deal for the short speedways in the second half of the season, but recorded DNF's in 2 of his 3 races with the team. He then was tabbed to replace the injured Cristiano da Matta in the final two races of the Champ Car season for the RuSPORT team, including his home country's race at Surfers Paradise. Briscoe signed a deal to drive for Penske Racing's Porsche LMP2 car in the American Le Mans Series and was named to a ride in the Indy 500 in a car owned by Stephen J. Luczo and Jay Penske with equipment leased from defending '500' champion Penske Racing. Driving the #12 Symantec Luczo Dragon Racing machine, Briscoe qualified 7th with a four lap average speed of 224.410. In the race on 28 May 2007, he completed all 166 laps before the race was called due to a driving rain. Briscoe finished 5th amongst the 33 participants earning him $302,305 and 30 driver points. Briscoe at the Indianapolis Motor Speedway in May 2008. 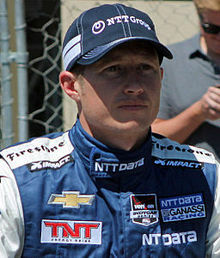 Ryan Briscoe signed to drive for Penske's IndyCar team as a race driver for the 2008 IndyCar Series season, replacing the former driver Sam Hornish, Jr., who started racing full-time in Penske's NASCAR team in 2008. Briscoe knocked himself out of the Indianapolis 500 along with Danica Patrick when Briscoe came out of the pits and ran into Patrick tearing up her suspension and tearing the front end of Briscoe's car. Patrick and Briscoe were fined $100,000 and placed on probation at the end of the 2008 season. Briscoe earned his first career win at Milwaukee the week after Indy, holding off Scott Dixon and avoiding a late crash involving Marco Andretti, Ed Carpenter, and Vitor Meira. Briscoe became the sixth driver in IndyCar history to score his first win while driving for Penske, following Mark Donohue (in 1971), Tom Sneva (1975), Rick Mears (1978), Paul Tracy (1993), and teammate Hélio Castroneves (2000). He followed up his first career win with a victory, shortly after the halfway point of the season, at the Honda 200 on the Mid-Ohio Sports Car Course. Briscoe also became the first Australian to claim victory at the Surfers Paradise Indy event on 26 October 2008, after countryman and favorite, Will Power, crashed out early in the race. In sportscars, Briscoe continued to drive for Penske Racing in the American Le Mans Series. Briscoe scored his only class victory that year at Petit Le Mans, winning with fellow Indycar driver Hélio Castroneves. Briscoe at the Indianapolis Motor Speedway in May 2009. At the beginning of 2013, Briscoe was unable to secure an Indycar ride; instead, he was hired by Level 5 Motorsports to drive an HPD ARX-03b in the P2 class of the 2013 12 Hours of Sebring. Briscoe won the race with Scott Tucker and Marino Franchitti, his first ALMS P2 class win since 2008. Later, just before the Toyota Grand Prix of Long Beach, Level 5 announced it had signed Briscoe on as a full-season P2 driver with Tucker. Just before the 2013 Grand Prix of Alabama, Chip Ganassi Racing announced they had signed Ryan Briscoe to return to the team for the Indy 500 as a 3rd driver. Following the 2013 Indianapolis 500, Panther Racing announced that it had signed Briscoe to replace J. R. Hildebrand in the #4 National Guard car from Detroit onward. Following Dario Franchitti's retirement, Tony Kanaan moved from a planned fourth Ganassi Racing car, and Briscoe took over the #8 NTT Data car from Kanaan. He finished 11th in the points and failed to finish on the podium. He parted ways with Ganassi at the end of the season, as the No. 8 car needed more funding to continue. For the 2015 IndyCar Series season Briscoe had been in negotiations to race for Schmidt Peterson Motorsports, but that fell through when financial arrangements could not be made for the team to field a third car. However, Schmidt Peterson Motorsports called Briscoe in as replacement driver for James Hinchcliffe at the 2015 Indianapolis 500 after Hinchcliffe suffered a severe injury after qualifying for the race. He returned to the team at Texas and joined as permanent replacement driver at Fontana. He collected four top-ten finishes in eight races. † As Briscoe was a guest driver, he was ineligible for points. * Was entered as Third Driver, but did not run due to bad weather. ^ Pruett, Marshall (6 May 2018). "Simpson, Briscoe become U.S. citizens". RACER. Retrieved 8 May 2018. ^ a b "Briscoe ready to debut at Daytona". BBC Sport. 17 January 2005. Retrieved 2005-01-19. ^ John Schwarb (2008-05-25). "Patrick struggled with car all day before late crash took her out". Retrieved 2008-05-25. Wikimedia Commons has media related to Ryan Briscoe. 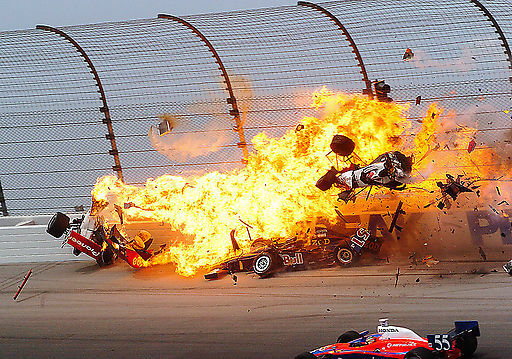 Photo sequence of infernal 2005 Chicagoland crash (from Paddocktalk).